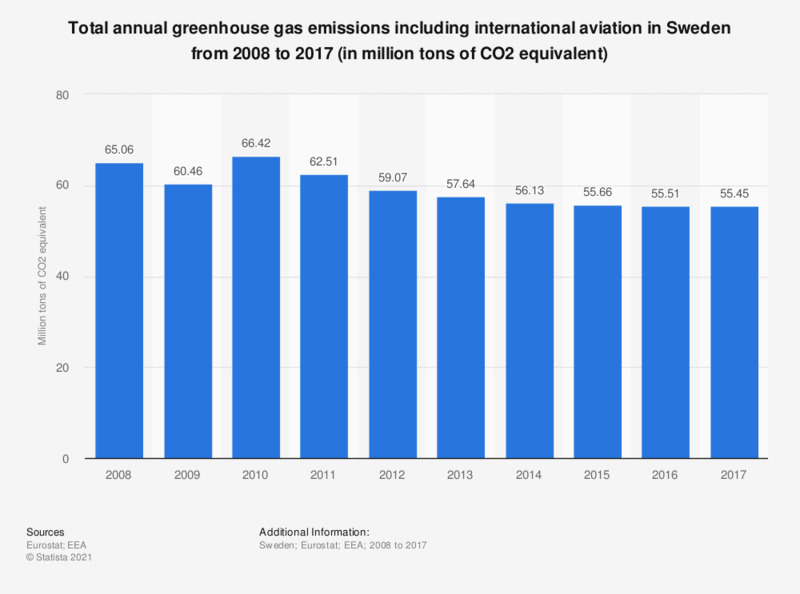 This statistic shows the total annual greenhouse gas emissions including the international aviation sector in Sweden from 2005 to 2014. In 2014, the total greenhouse gas emissions amounted to 56.68 million tons of CO2 equivalent. According to the source, "The annual greenhouse gas (GHG) emissions are estimated and reported under the United Nations Framework Convention on Climate Change (UNFCCC), the Kyoto Protocol and the Decision 525/2013/EC. The so called Kyoto basket includes six gases: carbon dioxide (CO2), methane (CH4), nitrous oxide (N2O), hydrofluorocarbons (HFCs), perfluorocarbons (PFCs), and sulphur hexafluoride (SF6). The impact of land use, land use changes and forestry (LULUCF) on the GHG inventories is excluded. International aviation is included. Emissions are weighted according to the global warming potential of each gas. To obtain emissions in CO2-equivalents using their global warming potential (GWP) the following weighting factors are used: CH4=25 and N2O=298, NF3=17200 and SF6=22800. HFCs and PFCs comprise a large number of different gases that have different GWPs."